Ascension Health continues to grow its revenue, although its operating income was significantly stifled in its fiscal 2018 as the massive health system works to standardize its revenue cycle system-wide. The Catholic, not-for-profit health system's operating income fell 81% between fiscal 2017 and 2018, which ended June 30, from $553 million on $22.7 billion in total operating revenue to $105 million on $23.2 billion in operating revenue, according to Ascension's year-end financial report. 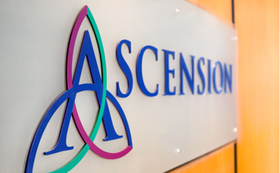 During that time, Ascension's operating expenses grew by $915 million year-over-year, or 4.2%, a change the health system attributed mostly to the addition of Chicago-based Presence Health Network effective March 1. On a same facility basis, operating expenses grew 1.6%, or $345.2 million, and was attributed to an increase in purchased services expenses, which grew 19.1%, or $360.5 million, between fiscal 2017 and 2018. St. Louis-based Ascension attributed that increase primarily to its continued efforts to standardize its revenue cycle systemwide. Ascension transitioned its employees to its revenue-cycle provider, Chicago-based R1 RCM. Ascension is currently in a 10-year exclusive agreement to use R1. The increase in revenue cycle purchased services was offset by decreases in salaries and wages, benefits, collection agency fees and other operating costs, the system wrote in its report. Ascension spokesman Johnny Smith could not say how many Ascension employees have transitioned to R1. R1's CEO, Joe Flanagan, said in August that the company planned to bring on board approximately 1,800 employees from Presence and Ascension's joint venture, Amita Health, in the fourth quarter. He also said R1 forecasts adding $1.8 billion in net patient revenue from Amita this year alone. "Ascension continues its strong commitment to caring for persons most vulnerable in our communities with nearly $2 billion in care provided in the most recent fiscal year while also reporting a net income margin of 9.3%," Smith wrote in an email. In fiscal 2018, Ascension reported a $175 million drop in salaries, wages and benefits expenses from transitioning certain services to external organizations, such as the transition to R1. That drop is also the result of programs targeting productivity and pay practices that have resulted in right-sizing staffing levels that have cut overtime pay and agency costs. That decrease was partially offset by merit and cost of living adjustments and provider recruitments. Overall, salaries and benefits comprised 58.8% of Ascension's total net patient service revenue on a same facility basis in fiscal 2018, compared with 60.4% in fiscal 2017. Ascension's acute discharges fell slightly between fiscal 2017 and 2018, from 724,531 to 716,836. Acute patient days also dropped 1.1% during that time to 3.2 million. Patient length of stay was unchanged year-over-year at 4.5 days. During its fiscal 2018, Ascension completed a significant, multi-year enterprise resource planning project called Symphony. The project's capitalized cost was $363 million at the end of fiscal 2018 as compared to $351 million at the end of fiscal 2017. Ascension wrote in its report that the costs are being amortized on a straight-line basis over the expected useful life of the software. Ascension spent $576 million on charity care in fiscal 2018, representing nearly 2.5% of its total operating revenue, compared with $538 million in fiscal 2017. Ascension had the fourth-highest charity care ratio among the country's 20 largest health systems in 2016, according to a Modern Healthcare analysis.